So, Bill, I took your sage advice as I set out to create a casual, lemony summer tablescape! Another example of making lemonade out of lemons: These crazy standard outdoor tables are only 30″ wide. (I need to have a serious talk with the manufacturers!) 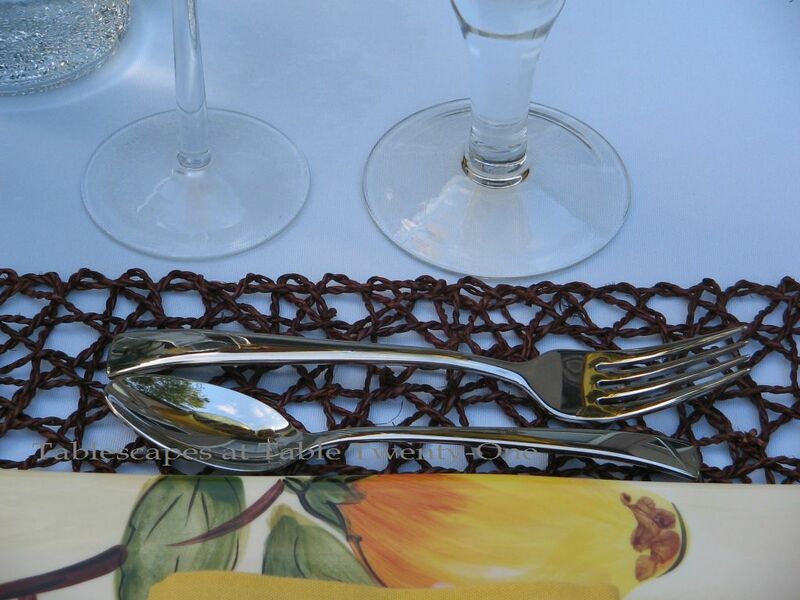 The narrow dimensions would not allow for the placemats to set properly, so I zig-zagged the seating. I have done this before, and it actually works quite well in practice. You’d be surprised how much your guests appreciate the extra elbow room (think gnawing on ribs or cracking shellfish!) and are still able to chat comfortably with one another. This layout adds a little more visual interest, too! The weather finally cooled enough to get out on the deck. Such a shame when we think the mid-90’s is “cooler.” Thankful for the opportunity, though, I took immediate advantage! I am so fond of the look a full-length table linen provides. It adds a touch of subtle formality to the most casual table. 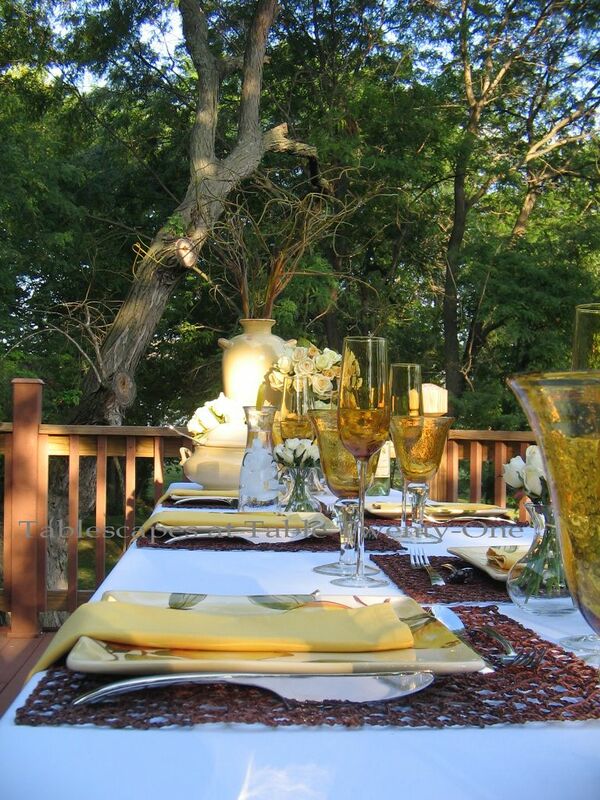 The base white table linens here are enlivened with lots of sunny, bright yellow. 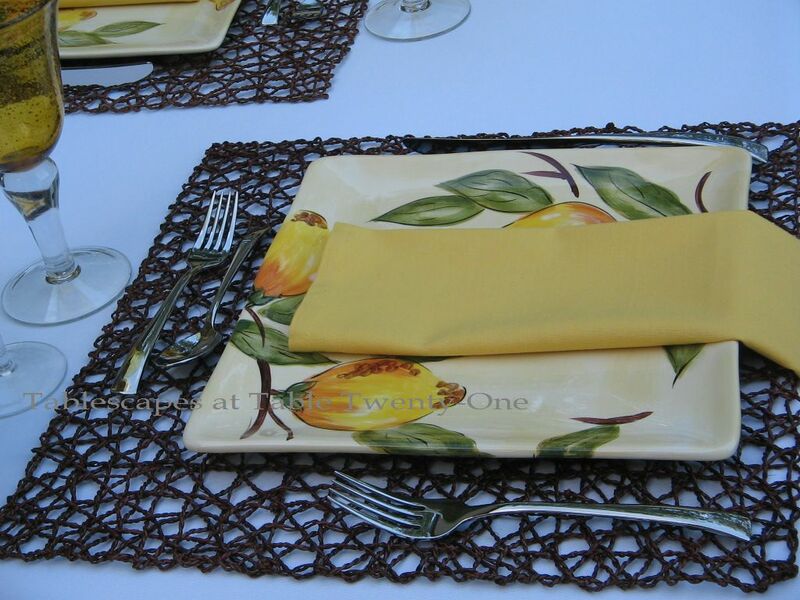 A dark woven placemat from Pier 1 is topped with lemon-laden “Lemon Orchard” dinner plates also from Pier 1. Simple yellow cotton napkins from Bed Bath & Beyond hang in a simple vertical fold off the plate. Contemporary J.A. Henckels “Bellaserra” flatware complements the square plate. Amber stemware with a yellow undertone is set European style at the head of the setting. 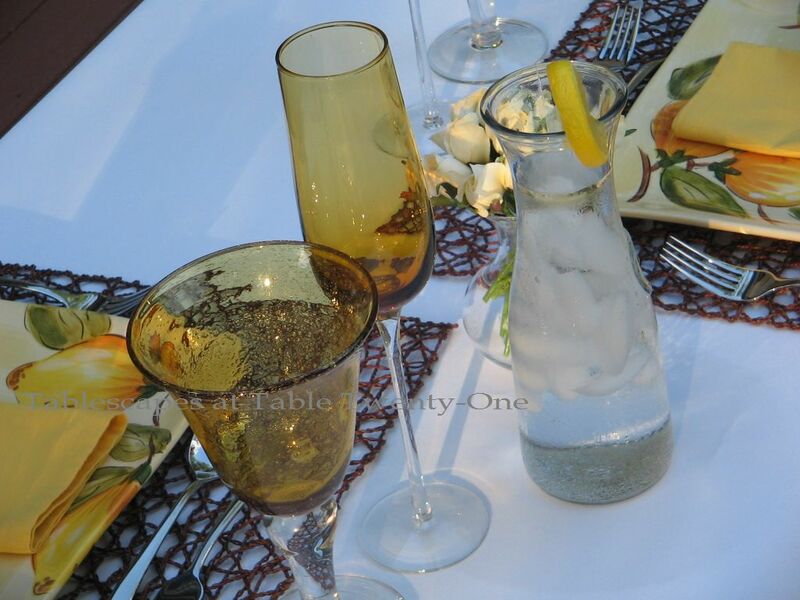 The champagne flutes are from World Market, and the bubble glass water stems are from TJ Maxx. Simple clear water carafes are dressed up a bit with a lemon slice. 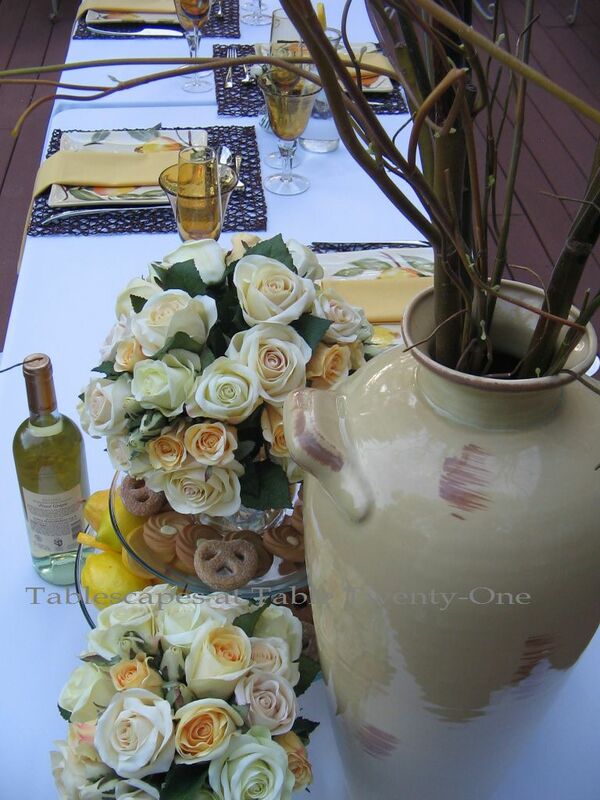 Tiny bouquets of pale yellow sweetheart roses are placed between place settings. I echo Bill’s sentiment that an end centerpiece is a great way to balance things out when you have more table than place settings on an oblong table. By placing the smaller arrangements down the center as I did with the sweetheart roses, the theme is repeated but in not such a dramatic fashion. Another advantage of an end centerpiece: Sometimes you have a tall centerpiece arrangement that would go great with your dishes but is better suited for a round table. No problem…put that bad boy on the end! Also great for centerpieces that would otherwise obstruct your guests’ view during dinner conversation. 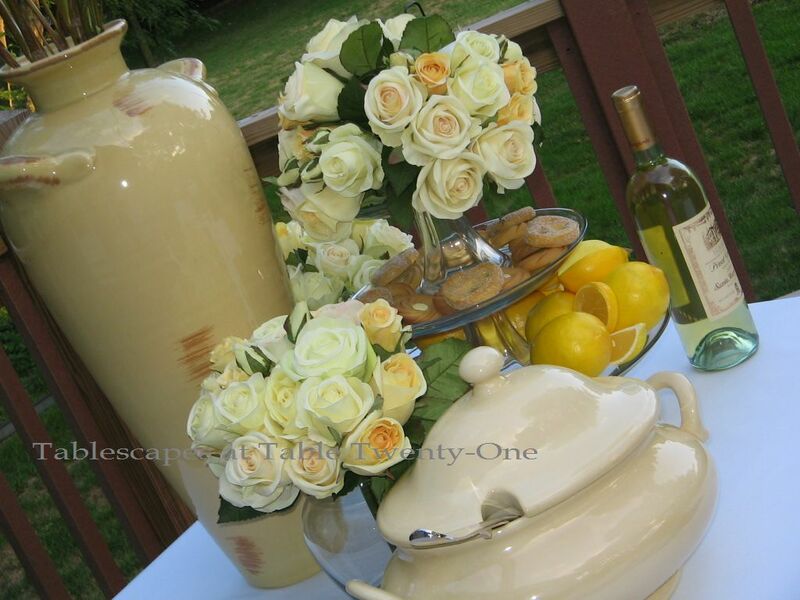 I bought the creamy yellow tureen from Pottery Barn a couple of years ago. It was marked all the way down to $12. I cradled it like the winning touchdown football at the Super Bowl until I was able to make my way to the check out counter to confirm the unbelievable price! The mix of yellow and cream-colored roses are displayed here in two clear ginger vases as well as clustered in bunches atop stacked cake stands. This is such a lush look and easy to achieve when you haven’t the time/energy/skill/inclination to fuss with an arrangement. Lemonade out of lemons! Thanks, Bill! I made it through another week! 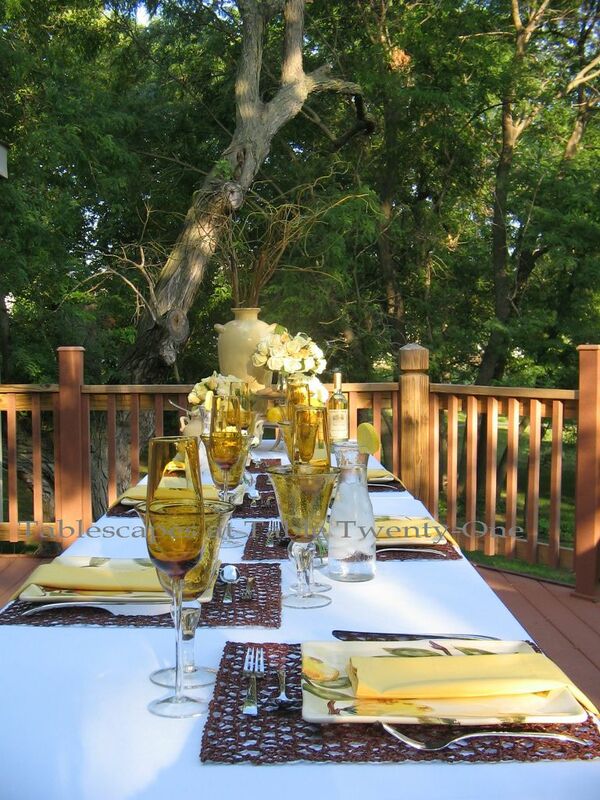 Both Bill and I will be joining Susan and all the other fabulous tablescapers at Between Naps on the Porch this Thursday for Tablescape Thursday. I hope you’ll join us. There is an awful lot of talent out there! You can also find me at BeBetsy.com! I love it! Alycia this table is gorgeously breathtaking! Will it ever be 70-75 degrees out during the day again? Will it? Will it??????? 😉 Sure doesn’t seem like it! I’m suffocating in this heat today! Thanks for stopping in, Pat! Thank you, Mona my sweet! I used to do that end centerpiece thing a lot, and I have a renewed interest in it. Now all I need is to have a real dinner party again!!!!!!!! I had to chuckle at “I cradled it like the winning touchdown football at the Super Bowl”… it’s always thrilling to find a bargain and a beautiful one to boot! Another tablescape touchdown from you! Hey there, friend, you did it again. A stunner. You took lovely, simple place settings and whipped them into a frenzy with that end “centerpiece”. Now, THAT was so creatively done. Even the slice out of the lemon. Most people who where thinking to slice into a piece of fruit woud do it horizontally, but not our girl Alycia. (Of course, depending on how you were holding the lemon, horizonally could mean different things!) Come on…. you know what I mean. What would the table freak world do without Bill? Hey, Linda! Bill rocks, that’s for sure! He comes up with the best bargains. I don’t know whether to love him or hate him! 😉 That’s my buddy, though. I’m so glad you like this set up. I have long been a fan of end centerpieces because there are so many times I have something really great but it’s too concentrated for an oblong table. More often that not, the dessert ends up as a part of the end piece! So gorgeous — I am bookmarking this page for sure! One can never have too many lemons. Great idea, staggering the place settings. When you get those table manufacturers straightened out, let me know. Can I pin one of these photos? Hey there, Ellen!!!!! I’m glad you like it!!! I was SO happy to get outside!!! I think I’m going to have to get custom made tables someday….I think that’s my only hope! Oh, and you can pin whatever you want! 🙂 Thanks for stopping by!!! You did GREAT! It’s still summertime and lemonade is the drink of the season, especially with the ambiance you create. Wow, Alycia, that’s some amazing, casually elegant, showstoppin’ LEMONADE you’ve made today!!! I love the way the colors you’ve used stand out, as they repeat the subtle shades of nature of the background and the warm color of the deck below. As much as I love everything you’ve incorporated on the table and the way you’ve arranged it all so artfully, my eye went straight to the neatly tucked and folded corner of the tablecloth in the third photo. That level of attention to detail is part of what makes your tables so special. Thank you for the kind mention, Alycia. It was a complete surprise, and I felt truly honored. You noticed that?!??!?!!! Do you know I scrapped several earlier photos because that linen didn’t fall “just so”?!! Of course, you know that! You’re Bill and, as I said in the post, crazy loves company!!! 😉 Thank you for the inspiration! Lemonade sure beats the heck outta the lemons we’ve been dealt recently! Lynne, you’d better stop makin’ me blush! I’m glad you like the floor-length linen. I just love ’em…indoors and out! I spend a LOT of time washing and ironing them, but I don’t care. It’s worth it to me. Also, in summer the young girls sometimes tend to wear sun dresses that are just a little too short for my taste. I consider it a gesture to help them maintain modesty! 😉 Thank you for stopping by!!! Hi, Joni! Thank you so much! I must think I’m from Texas because I like everything BIG…especially my centerpieces! Sometimes, though, they just can’t sit in the center, so to the end they go! Nine times out of ten the dessert ends up down there with ’em! 🙂 Thanks for stopping by!!! I adore your end centerpiece – it adds drama but doesn’t get in the way of people talking to each other. Your stacked platters look fabulous and I love your soft lemon colors. What pretty evening lighting you captured! This would be a fabulous table to be invited over for. I saw a new saying that I like even better (probably because it contains more fat and calores ) If life gives you lemons, make lemon bars! You really did make lemonade out of lemons! Terrific theme for your table and funny comments about Bill! I love the “to the floor” tablecloth and the natural look of the placemats. A “end-piece” is perfect for long tables and yours is lovely! Alycia, your table is gorgeous. It should be in a magazine. I love everything you did. You have outdone yourself! Dear, sweet Bonnie…thank you! You are TOO sweet!!!!!! Have a fantabulous weekend! Oh I’m so glad that Bill challenged you to set such a lovely table for us. I truly like the idea of the end-piece. This is fabulous! Gorgeous! I love the “lemonade” you made! Love the end-piece! Thank you, Cherry Kay! I always appreciate your beautiful comments! I have always liked yellow, from the palest lemon to the darker amber tones. the roses make for a lovely centerpiece. Hi, Marigene! I just got through all of the posts for this week, and you’re right….a lot of folks are feelin’ the yellow!!! Alycia, I’m so glad Bill inspired you to “make lemonade”. Your lemonade “stand’ is gorgeous and the lemony yellow really whets the appetite. Yum! I really like the way you alternated the placemats and turned them vertically. Great idea! Hello, my dear Babs! You melt my heart. Thank you! The table you set today is a fresh of breath air., and looks so beautiful. Bill is one of the best table setter too your so right. Loved todays table centrepiece with lemons. Your picture drew me in to see it! I love the buttery lemon colors! Your stemware is perfect with it too! Those lemon plates make me jealous! 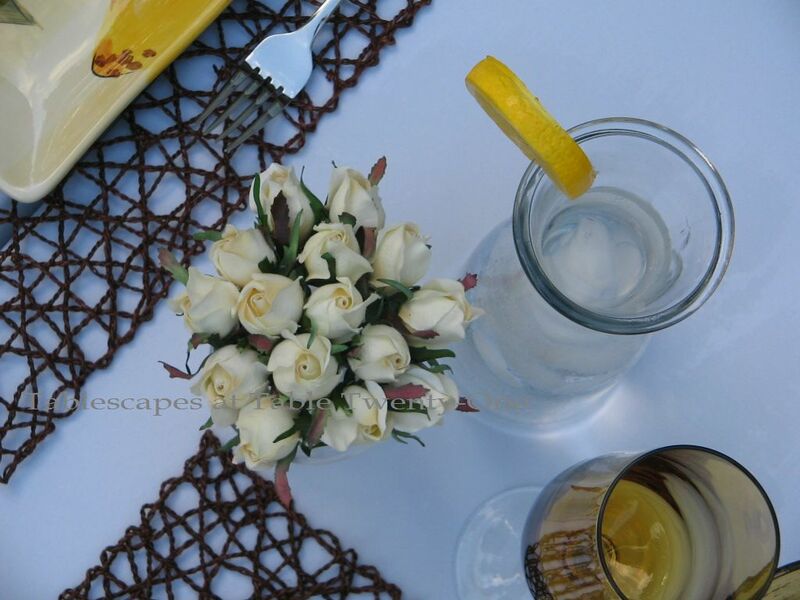 Your arrangement at the end of the table is pefect…great idea…glad to see some new ideas with your postings! Don’t you just love Bill! I wonder if he knows how many women love him out there!! He’s so kind and he talked to me when I had some questions on my first tablescape! He’s definitely inspirational! Hi, Liz! I found those plates at Pier 1 at the end of season last year on clearance. I think I only paid like $3 each for them. Talk about thrilled!!! As for Mr. Bill, he’s tops. He knows his antiques, that’s for sure!!! Have a good weekend, and thanks so much for stopping in! Thank you, Jo Ann! I’m so glad you had a chance to stop in and take a peek this evening! I love all your tables but I think this is my favorite. It’s so fresh and summery yet really elegant. I really like the way you zig zaged the settings too. P.S. thanks for tipping me off on Bill! I loe you, Taunnie! Thank you!!! Have a great weekend! What a lovely setting, Beautiful! Hello, Kay Ellen, and thank you for stopping by to say hi! Yellow has been a favorite of mine around the house for a long time, so I’m glad to bring it to the table!!! Have a nice weekend! This tablescape is beautiful!! The color scheme is wonderful and the setting is great. Love the amber glasses!! Hello, Tess! How are you??!??!! Thanks for stopping in and taking a peek. This is one of my favorites! How beautiful and I absolutely love those plates! I’m so glad Bill gave you the idea. Hi, Jo Ann! I’m glad he did, too! I was feeling all down in the mouth and he was just being a friend. I don’t think he realized he was also being an inspiration for a tablescape at the time! Have a great weekend, and thank you for dropping by! Oh, my friend Alycia, you really made me crack up using Bill’s quotes and applying them to you! Besides it, your tablescape at your gorgeous porch it’s just stunning! I love the three tier arrangement, how terrific that is, the plates with lemons are so pretty, along with the placemats and tabletopper! My daughter has those amber glasses and boy, do they go with everything, don’t they?! I adore the color all around it and yeah, I agree, we should make a nice dinner party with, at least some beans and weanies!! Thanks for coming by and leaving me such lovely comments, I so love your visits. Hi, Fabby! Thank you! Those amber glasses are pretty popular. When I finally bought them last year I figured I would get a lot of use out of them! Hi, Dianne! I know there is a lot of beauty out there, but I’m going to have to enjoy it from the ground! 🙂 Thanks for stopping by, and have a great weekend! Oh this is beautiful! I love the plates & the rich golden tones. Just perfect for the end of summer. Hi, Gina, and thanks! I am so glad you stopped by! Oh my gosh that is so beautiful. I don’t even think I can pick a favorite, everything is just so perfect together! Thanks for stopping by my blog…your comments are always so kind. Hey there, Christina! Thanks for poppin’ in! Glad to have you as a guest! I really enjoy reading your posts, and it’s fun to see how you newlyweds are doing! I look forward to it each week! It’s nice to meet you too. Yes, this was the first time I joined Tablescape Thursday. I admire other bloggers’ talents for creating beautiful and inviting table settings, but I am just learning this art myself. 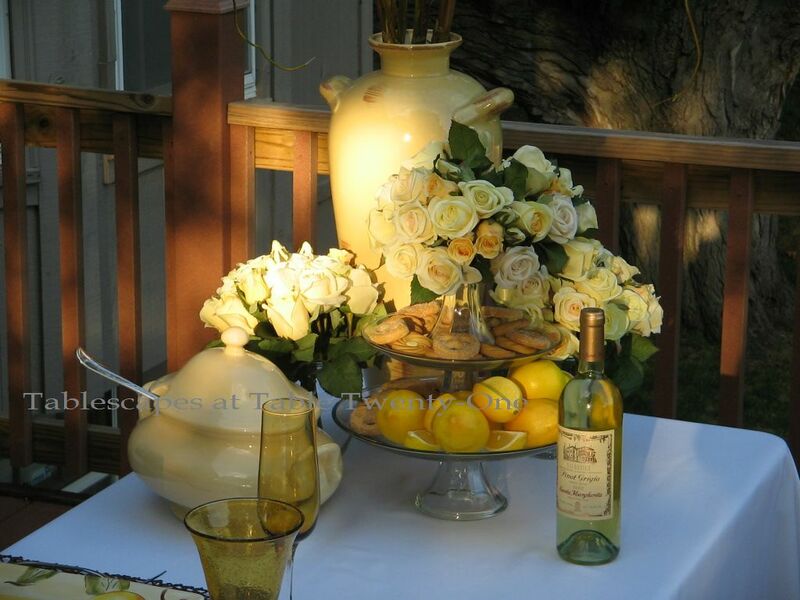 Your Lemonade Out of Lemons tablescape is gorgeous! 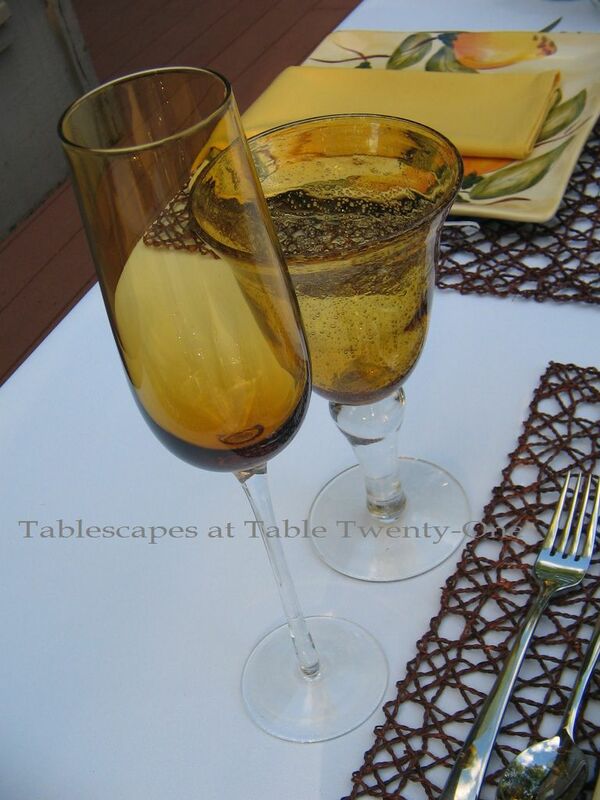 Thanks for stopping by, Olga, and welcome to Tablescape Thursdays! You are going to have so much fun!!! This is a great group of people, and it really helps us to hone our skills. I look forward to seeing your posts!!! Hi Alycia, thank you for stopping by and for leaving me the tip to check Pier 1 for my wicker arm chairs. Another blogger had mentioned she purchased hers there some years ago. I’ll have to check it out this weekend. Your table is delicious to the eyes. I would not hesitate to accept a dinner invitation from you but I may never leave such a beautiful setting. Can you imagine? What a rude guest, huh? 😉 I smiled the minute I clicked on your page because yesterday during my Tablescape visits, I thought how wonderful a lemon theme would be. I am giddy about lemons. You’ve done a beautiful job here, my dear. Hi, Marcia, and thank you a million times over for stopping by!!! You are welcome any time…especially if lemons are on the decorative menu! Have a sunshiny weekend! Oh, and by the way, 21 is my favorite number. Too funny. YUMMY~~~~Those tables drive me crazy too! I do the same thing, but I never thought to put the centerpiece on the end!!! What a great idea…rather than trying to find something to fit in that tiny little space on that tiny little table! Kudos and Bravo! Love the table….for some reason I am thiiiiirsty! Hey, Wendy! Glad you like that idea! It really gives you a lot of wiggle room – literally and figuratively – when it comes to decorating those narrow tables. I wish I had a handy hubby who could whip up a sturdy 42″ wide outdoor table for me! 😉 I’m thirsty, too thinking about all those lemons. Think I’ll mosey on down to the kitchen. Have a great weekend, and thanks for stopping in! Love your table, such pretty glasses too. The roses are just gorgeous! Love the table, A. Did Bill come visit yet? He makes himself scarce! Oh wait, I see he has been here. You did a great job on this table. Magazine worthy! See you soon unless we blow away! Irene has her eyes on us here on LI! Bill’s my buddy. He totally rocks with his tables. I think we’d ALL like to live next door to him so we could borrow his accoutrements! It never ceases to amaze me just how much talent…and how many dishes, etc!…is out there. I’m going to have to have a little talk with you out in the alley about puttin’ ketchup on filet mignon. Girl, don’t you know I’m from BEEF country??!?!?!! Just like the saying “Don’t mess with Texas”, we have a saying here: “Don’t beef with the beef!” I’m watching this pitiful Governor’s Cup game between the KC Chiefs and the St. Louis Rams. I think it’s time to open up a few liquid refreshments to be able to stomach this debacle! DO NOT BLOW AWAY!!! Batten down the hatches and hang on tight or skidaddle on out of there ASAP! Be safe, Kathleen. I’m praying for you guys out there. Sorry for all those happy faces, didn’t know you had that here! Thank you, Jenny! Thanks for stopping by to check it out! 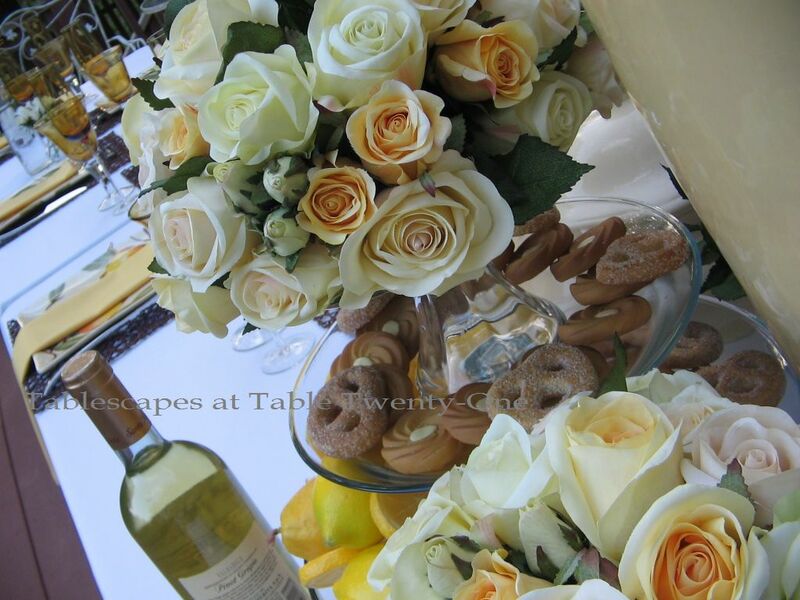 I love this yellow, mellow tablescape and the end centerpiece flowers are beautiful. What a wonder job! Thanks so much for sharing another great tablescape and for coming by for a visit. This is lovely. I love black and yellow together, and those plates! Wonderful. I like how you’ve offset everything setting in order to give people the maximum amount of room. Very nice.